From the Douche, to The League’s Ruxin, to basically every single character he’s ever played on Kroll Show, Comedy Bang! Bang!, and every talk show appearance ever, Nick Kroll traffics in aggressively comedic jerks. (Actually, he’s reportedly really good in a serious role as a real-life Nazi hunter in this year’s Operation Finale, but there’s the exception proving the rule.) Friday’s Tonight Show appearance did not, however, prove an exception, as Kroll came out doing a bit about being pissed off that Jimmy Fallon’s first guest, the universally beloved Dolly Parton, got to do the big Christmas song duet with Fallon he’d been planning. “Is this the right way to start the segment?,” Kroll deadpanned to the Tonight Show crowd’s stony silence at his “I’m so mad at Dolly Parton” opener, a suitably Douche-y way to announce his presence. With Fallon giggling along, as is his way, Kroll gamely then took part in one of the host’s signature goof-off games, as he ran through a marathon of impressions from his hilarious, touchingly filthy animated series Big Mouth. (Including his suspiciously Will Arnett-sounding Hormone Monster, Maury.) 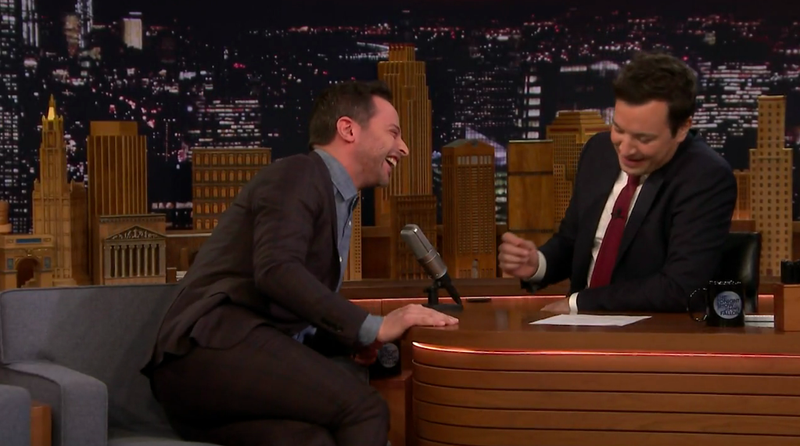 Fallon, noting that Kroll performs some 25 separate voices on the show, called his guest “today’s Mel Blanc” (but, you know, Douche-ier), before setting Kroll off on quick-hit performances of the likes of Coach Steve, Rabbi Poblart, Maury, decrepit Hormone Monster Rick, and that enthusiastically borderline-offensive ladybug. He also joked, in passing, “Maya Rudolph is the girls’ Hormone Monster, and she’s not talented,” reigniting audience ire. The Tonight Show crowd and Fallon were also clearly nonplussed by Kroll’s description of how his Big Mouth character, late-bloomer Nick’s two lonely pubic hairs are voiced by Craig Robinson and Jack McBrayer (at least until the incident), which tracks, demographically speaking. More disreputably hilarious Big Mouth (and Kroll) for the rest of us.